Home	> Lot #004: Mishpatei Sh’vuos. First edition. Venice 1602. Lot #004: Mishpatei Sh’vuos. First edition. Venice 1602. Treatise on the laws of vows “Sh’vuos” authored by Rav Hai Gaon. With addenda “Mekach U’Memkar”, “Shitta Chadoshah L’Breishis Rabboh” and “Braissa D’Meleches Ha’Mishkan” by the same author. 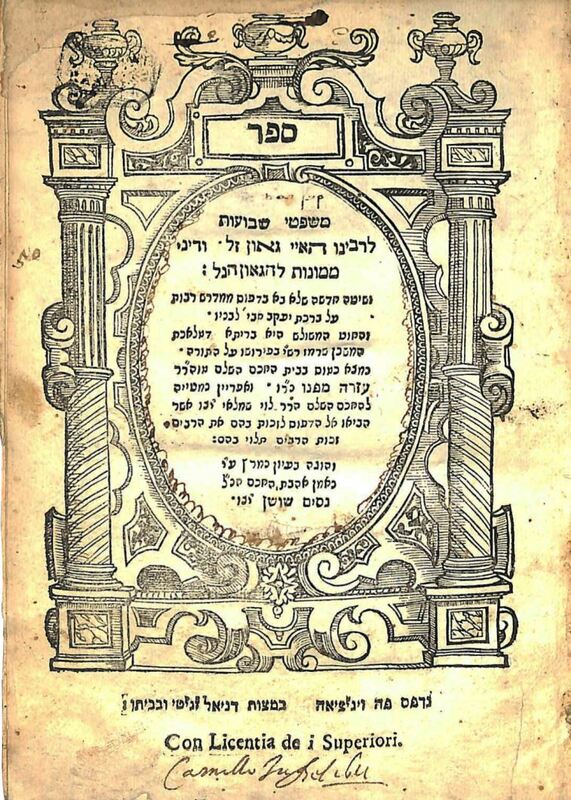 Rav Hai Gaon (969-1038) was the son and disciple of Rav Shreira Gaon, whom he succeeded as “Raish Mesivta” (Rosh Yeshiva) in Mesopotamia (Pumpedeisa). He is generally considered to be the last “Gaon” of the “Gaonic” era. 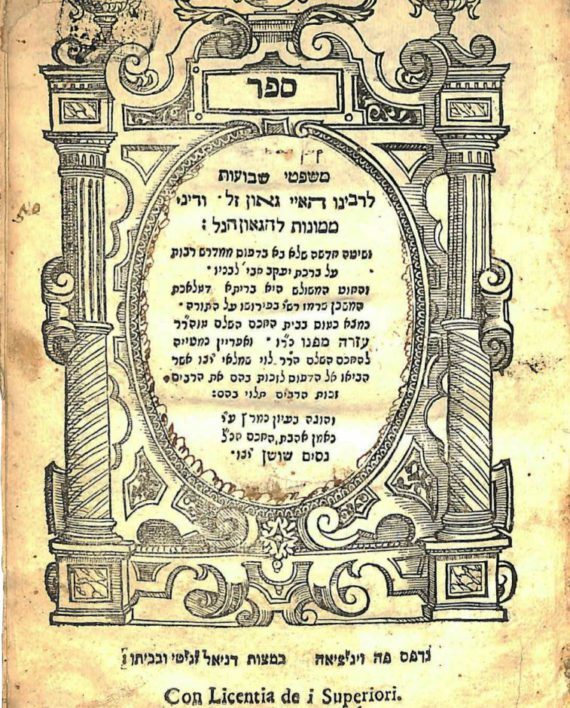 Halachic queries were sent to him from Germany, France, Iberia, Anatolia, The Maghreb, and even India and Ethiopia. Most of his responsa were written in Arabic and only a few of them have survived. Rav Hai’s disciples included Rabbainu Chananel and several other early Rishonim. Vinograd Venice 951. Zanetti press. 55 pages. 19 cm. Antique binding. Good condition, some water staining. Small restoration to title page affecting edge of woodcut border. וינוגרד ויניציה 951. דפוס זניטי, 55 עמודים. 19 ס”מ. מצב טוב, מעט כתמי מים. תיקון קטן לעמוד השער המשפיע על קצה גבול גילוף העץ.